In my last post, I started discussing Bump Mapping and showed a mechanism through which we can generate a normal map from any diffuse texture. At the time, I signed off by mentioning next time I would show you how to apply a bump map on a trivial surface. This is what we are going to do today. Oops! It seems your browser does not support HTML5 Video. You can see the GIF version here (15 MB). In the video above you can see the results of the effect we are trying to achieve. This video was generated from a GIF file created using the Vortex Engine. 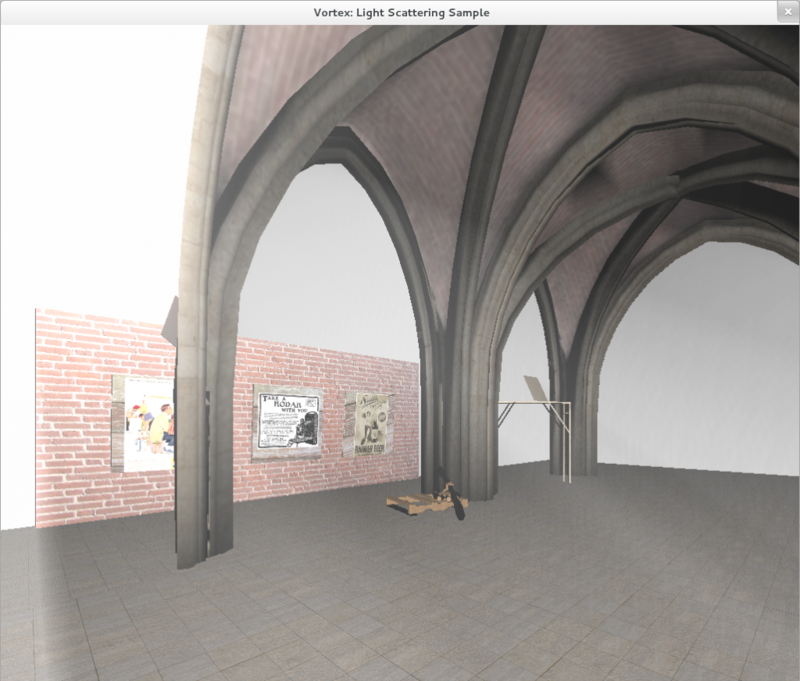 It clearly shows the dramatic lighting effect bump mapping achieves. 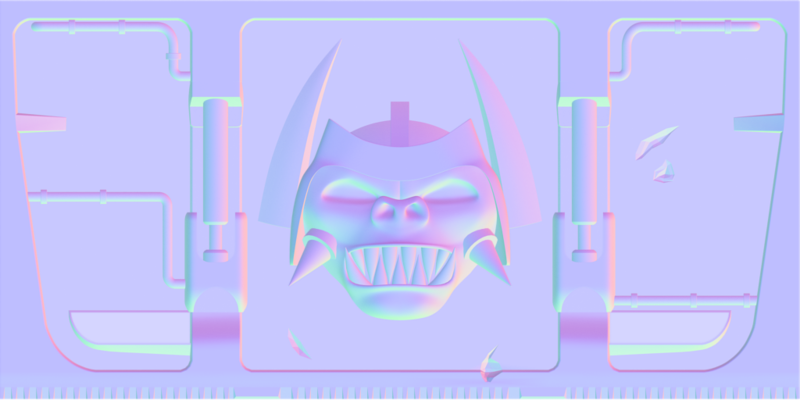 Although it may seem as if this image is composed of a detailed mesh of the boss’ head, it is in fact just two triangles. If you could see the image from the side, you’d see it’s completely flat! The illusion of curvature and depth is generated by applying per-pixel lighting on a bump mapped surface. How does bump mapping work? Our algorithm will take as input two images: the diffuse map and the bump map. The diffuse map is just the colors of each pixel in the image, whereas the bump map consists in an encoded set of per-pixel normals that we will use to affect our lighting equation. 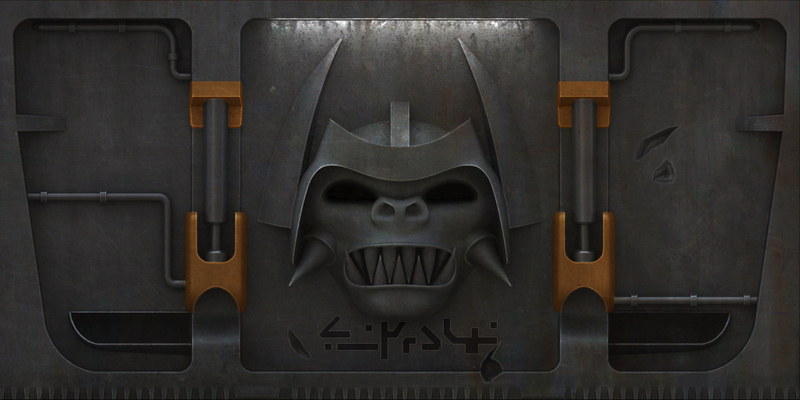 Diffuse map of the boss door. 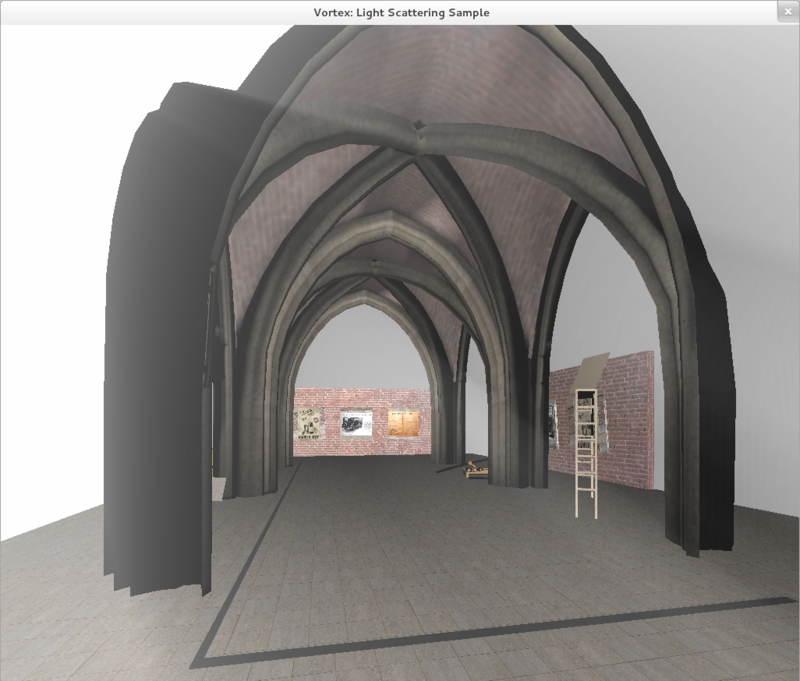 Image taken from the Duke3D HRP project. Bump map of the boss door. Image taken from the Duke3D HRP project. I’m using these images taken from the excellent Duke3D High Resolution Pack (HRP) for educational purposes. Although we could’ve generated the bump map using the technique from my previous post, this especially-tailored bump map will provide better results. Believe it or not, there are no more input textures used! The final image was produced by applying the technique on these two. This is the reason I think bump mapping is such a game changer. This technique alone can significantly up the quality and realism of the images our renderers produce. 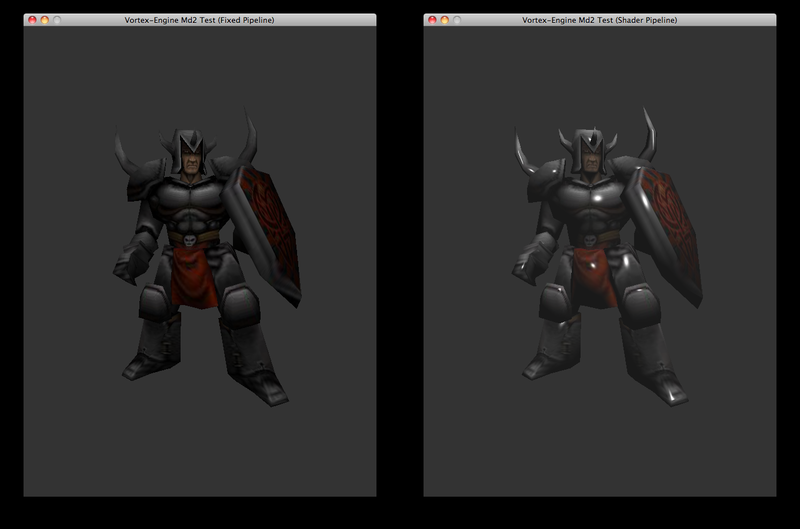 It is especially shocking when we compare the diffuse map with the final bump-mapped image. Even if we applied per-pixel lighting to the diffuse map in our rendering pipeline, the results would be nowhere close to what we can achieve with bump mapping. Bump mapping really makes this door “pop out” of its surface. The theory I develop in these sections is heavily based on the books Mathematics for 3D Game Programming and Computer Graphics from Eric Lengyel and More OpenGL from David Astle. 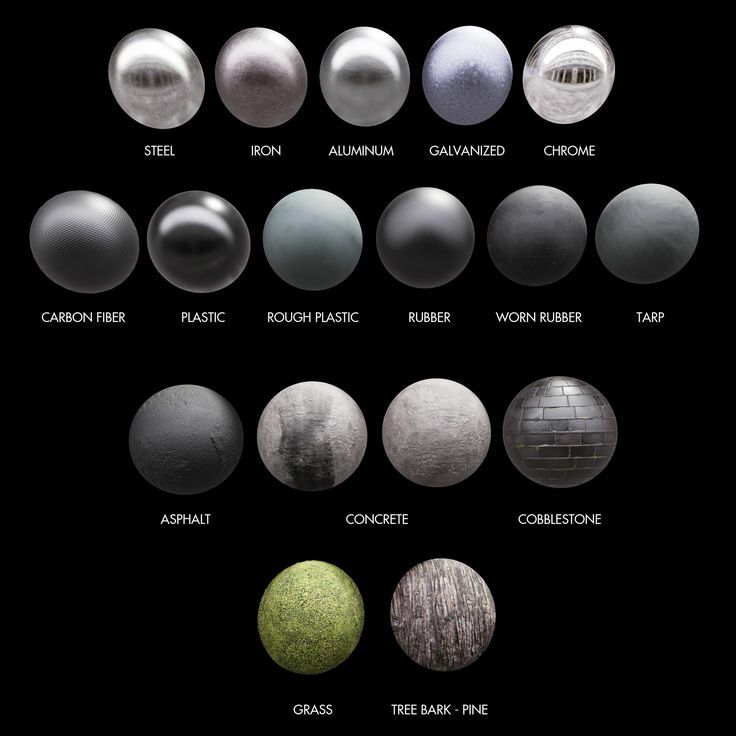 You should check those books for the definitive reference on bump mapping. Here, I try to explain the concepts in simple terms. So far, you might have noticed I’ve been mentioning that the bump map consists of the “deformed” normals that we should use when applying the lighting equation to the scene. 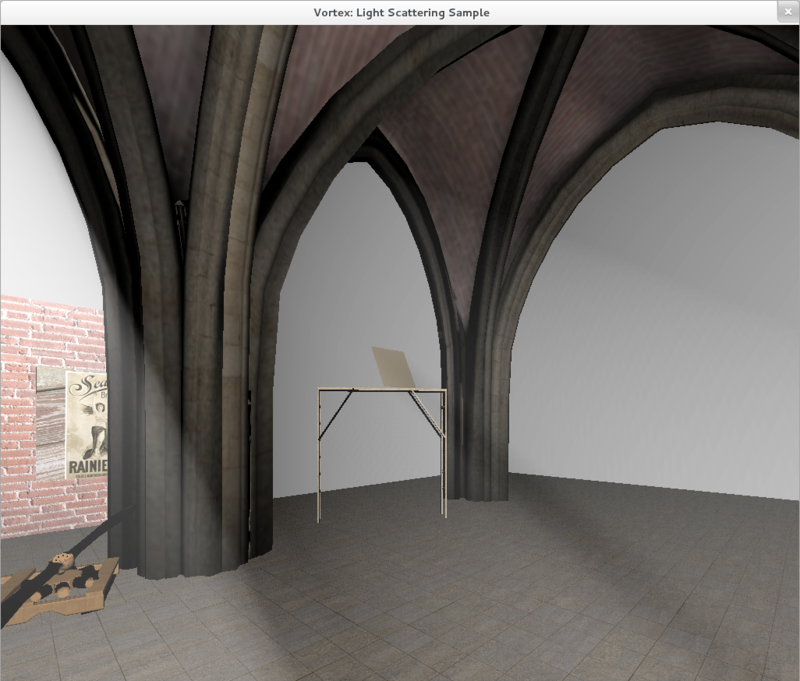 But I haven’t mentioned how these normals are actually introduced into our lighting equations. 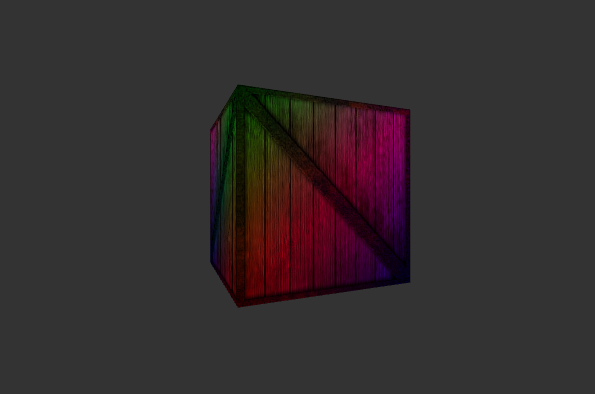 Remember from my previous post how we mentioned that normals are stored in the RGB image? Remember that normals close to (0,0,1) looked blueish? Well, that is because normals are stored in a coordinate system that corresponds to the image. This means that, unfortunately, we can’t just take each normal N and plug it into our lighting equation. If we call L the vector that takes each 3D point (corresponding to each fragment) to the light source, the problem here is that L and N are in different coordinate systems. L is, of course, in camera or world space, depending on where you like doing your lighting math. But where is N? N is defined in terms of the image. That’s neither of those spaces. Where is it then? Well, N is actually in its own coordinate system that authors refer to as “tangent space”. It’s its own coordinate system. In order to apply per-pixel lighting using the normals coming from the bump map, we’ll have to bring all vectors to the same coordinate system. For bump mapping, we usually bring the L vector into tangent space instead of bringing all the normals back into camera/world space. It seems more convenient and should produce the same results. Once L has been transformed, we will retrieve N from the bump map and use the Lambert equation between these two to calculate the light intensity at the fragment. How can we convert from camera space to tangent space? Tangent space is not by itself defined in terms of anything that we can map to our mesh. So, we will have to use one additional piece of information to determine the relationship between these two spaces. Given that our meshes are composed of triangles, we will assume the bump map is to be mapped on top of each triangle. The orientation will be given by the direction of the texture coordinates of the vertices that comprise the triangle. This means that if we have a triangle that has an edge: (-1,1)(1,1) with texture coordinates: (0,1)(1,1), a horizontal vector (1,0) represents a vector tangent to the vertices that is aligned with the horizontal texture coordinates. We will call this the tangent. Now, we need two more vectors in order to define the coordinate system. Well, the other vector we can use is the normal of the triangle. This vector is, by definition, perpendicular to the surface and will be perpendicular to the tangent. The final vector we will use to define the coordinate system has to be perpendicular to both, the normal and the tangent, so we can calculate it using a cross product. There is an ongoing debate whether this vector should be called the “bitangent” or the “binormal” vector. According to Eric Lengyel the term “binormal” makes no sense from a mathematical standpoint, so we will refer to it as the “bitangent”. Now that we have three vectors that define the tangent space, we can create a transformation matrix that takes vector L and puts it in the same coordinate system that the normals for that specific triangle. Doing this for every triangle will allow applying bump mapping on the triangle. Although we can compute the bitangent and the transform matrix in our vertex shader, we will have to supply the tangent vectors as input to our shader program. Tangent vectors need to be calculated using the CPU, but (thankfully) only once. Once we have them, we supply them as an additional vertex array. Calculating the tangent vectors is trivial for a simple surface like our door, but can become very tricky for an arbitrary mesh. The book Mathematics for 3D Game Programming and Computer Graphics provides a very convenient algorithm to do so, and is widely cited in other books and the web. Once we have the bitangents and the transformation matrix, we rotate L in the vertex shader, and pass it down to the fragment shader as a varying attribute, interpolating it over the surface of the triangle. Our fragment shader can just take L, retrieve (and decode) N from the bump map texture and apply the Lambert equation on both of them. The rest of the fragment shading algorithm need not be changed if we are not applying specular highlights. Bump mapping is an awesome technique that greatly improves the lighting in our renderers at limited additional costs. Its implementation is not without a challenge, however. After loading the geometry, compute the per-vertex tangent vectors in the CPU. Pass down the per-vertex tangents as an additional vertex array to the shader, along with the normal and other attributes. In the vertex shader, compute the bitangent vector. Compute vector L and transform it into tangent space using this matrix. Interpolate L over the triangle as part of the rasterization process. 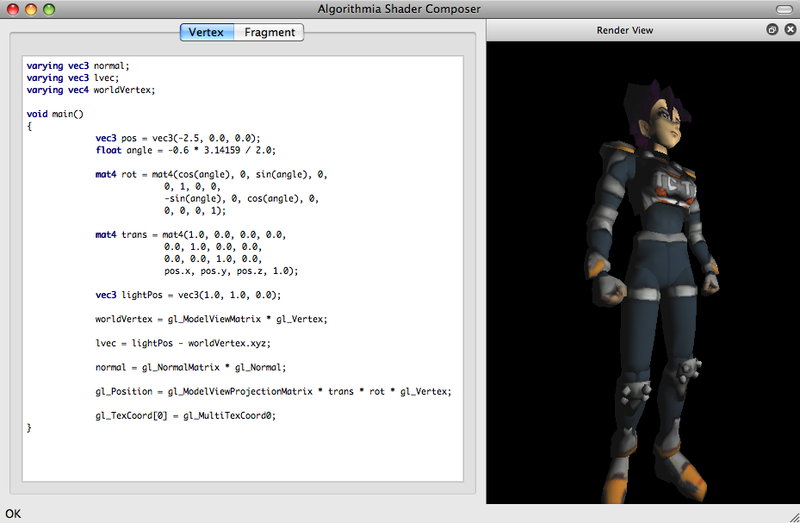 In the fragment shader, normalize L.
Retrieve the normal from the bump map by sampling the texture. Decode the RGBA values into a vector. Apply the Lambert equation using N and the normalized L.
Finish shading the triangle as usual. On the bright side, since this technique doesn’t require any additional shading stages, it can be implemented in both OpenGL and OpenGL ES 2.0 and run on most of today’s mobile devices. In my next post I will show bump mapping applied to a 3D model. Stay tuned! I’ve been meaning to look into WebGL for a while now. Coming from an OpenGL (and then an OpenGL ES 2.0) programming background, I figured it should be relatively “easy” to get up to speed with some basic primitive drawing. Luckily, I was not disappointed: WebGL’s specification was heavily based on OpenGL ES’ and knowledge can be easily transferred between the two. In this post I outline the main differences and similitudes between these two standards. 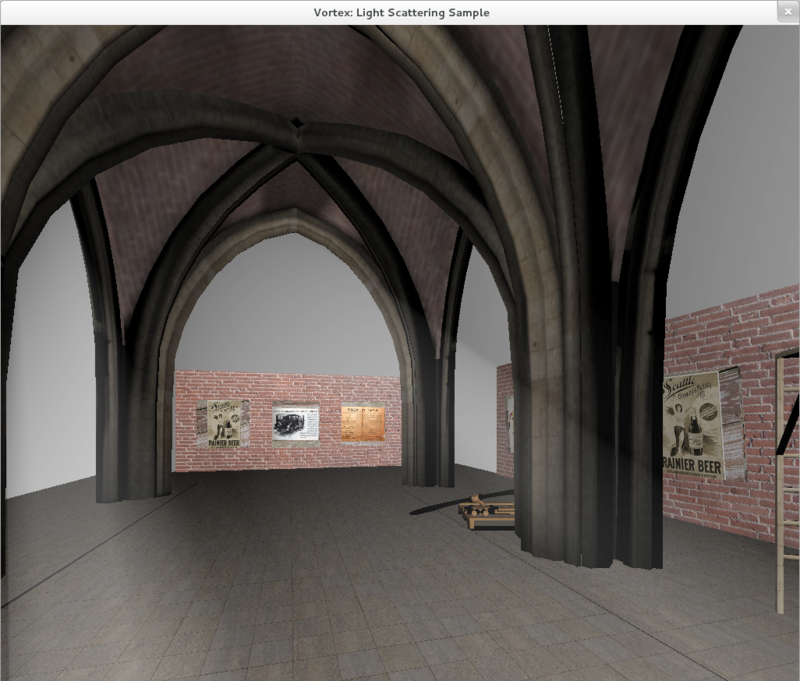 Screenshot of “WebGL Test” – a test program built to determine if WebGL is supported on a browser – Click on the image for the live version. 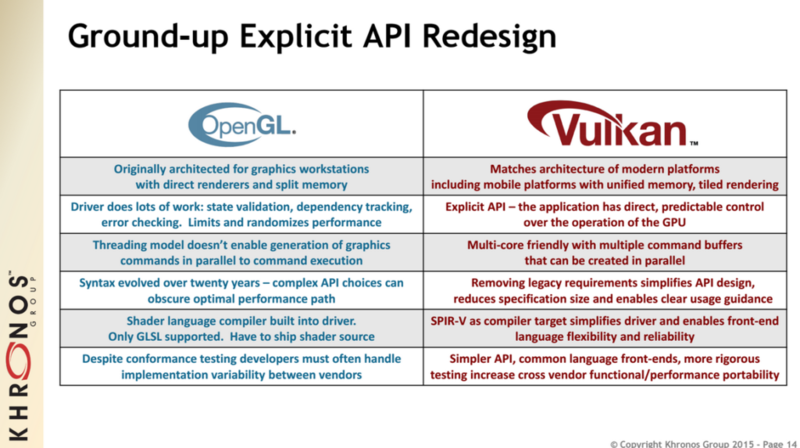 I was surprised to learn that WebGL, as an API, is even slimmer than OpenGL ES 2.0. 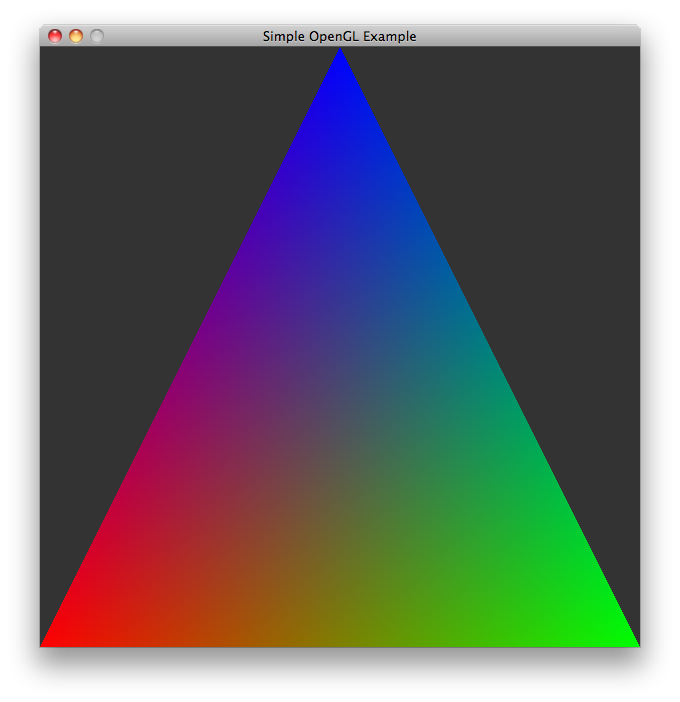 OpenGL ES 2.0 had already done away with many features from ES 1.1, so WebGL being even smaller, really feels minimal. This is not a bad thing at all, but may make the learning curve a little more steep for developers just getting started with the *GL APIs. In order to try WebGL, I decided to create a simple test application that determines if your browser supports it. 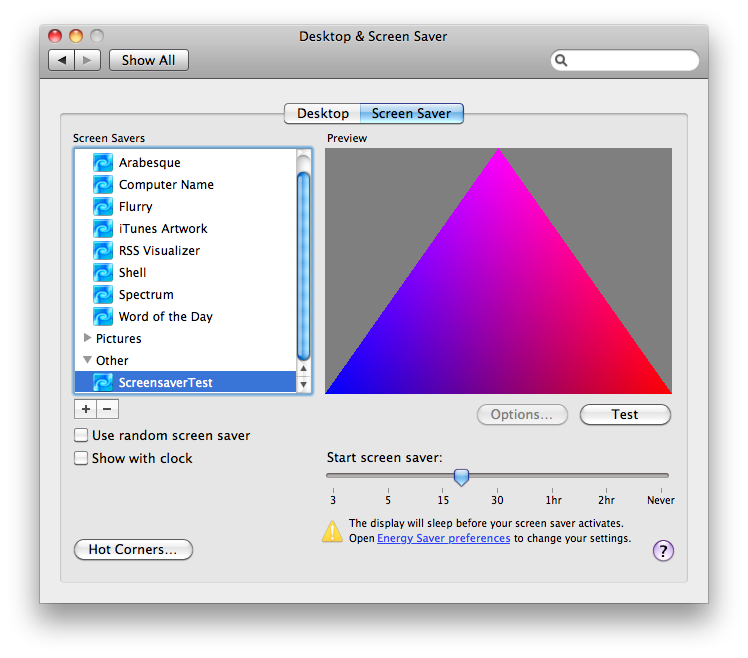 A screenshot of the application can be seen above. The live version can be accessed by clicking on it or clicking here. Data must be loaded into WebGL using helper types like Float32Array, which tightly packs vertex data into consecutive memory. This is mandatory for populating VBOs. You will have to deal with interleaved array data and feel comfortable counting bytes to compute strides and offsets. It’s the only way to keep the number of VBOs reasonable and is also one of the best practices for working with OpenGL and WebGL. There is no fixed-function pipeline. The T&L pipeline has to be coded. Shaders are mandatory. The current types are vertex and fragment shaders. Old data upload functions, such as immediate mode and display lists, are not supported. I find WebGL, with its fast iteration cycles (just change the code, save and refresh the browser window), a reasonable tool for prototyping 3D applications and quickly trying out ideas. The joy of not requiring the user to install any plugins and being able to present 3D data to them right in the browser is the icing on the cake and makes it a very interesting tool for people working in the 3D field. 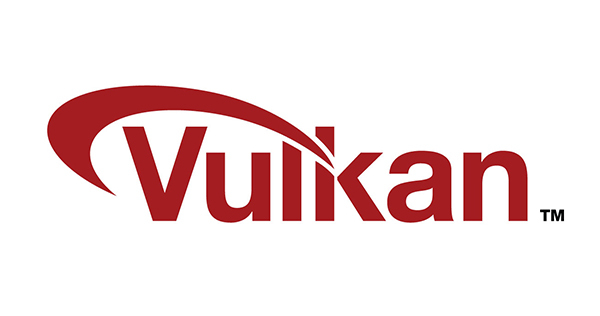 Stay tuned for more WebGL goodness coming soon! When we introduced Programmable Pipeline support to Vortex Engine, we claimed that better visual effects could now be introduced into the renderer. With the introduction of Render-to-Texture functionality into Vortex 2.0, coupled with the power of Shaders, we can now make good on our promise. Light Scattering (also known as “God Rays”) is a prime example of what can be achieved with Shaders and Render-to-Texture capabilities. It can be seen in the picture above how the the effect, although subtle, brings more life to the rendered scene. There is still much room to improve the visual results, though, particularily with the results of Kenny Mitchel’s article on GPU Gems 3. There is also room for optimization. Currently, the scene is rendered in realtime at an average of 187 frames per second, producing 1024×1024 images on a NVIDIA GeForce GTX465. Moving the algorithm to mobile devices, although easy from a coding perspective, might require extra work to achieve a high frame rate on the embedded GPU. Here are three more captures from different angles. 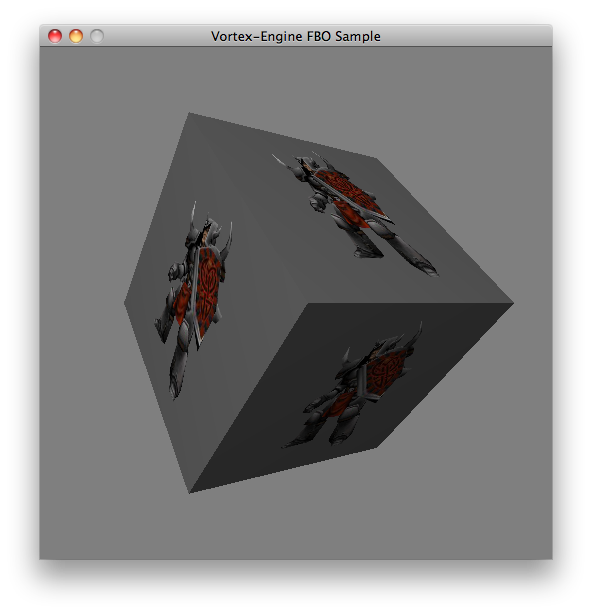 Vortex Render-to-Texture support: a knight is rendered on a texture that is then mapped on a cube. All rendering is done on the GPU, avoiding expensive copies to RAM. I wanted to improve the Stencil Shadow Volumes code a little bit and enable it for the Programmable Pipeline in Vortex, however, I had to take a small detour to fix an issue related to mobile device support. It turns out that OpenGL ES, the 3D library that Vortex uses to render its graphics on mobile devices, does not support rendering indexed geometry for indices larger than 16 bits. Keep this in mind when developing for mobile devices such as the iPhone or iPad. I can completely understand the reasoning behind this decision. 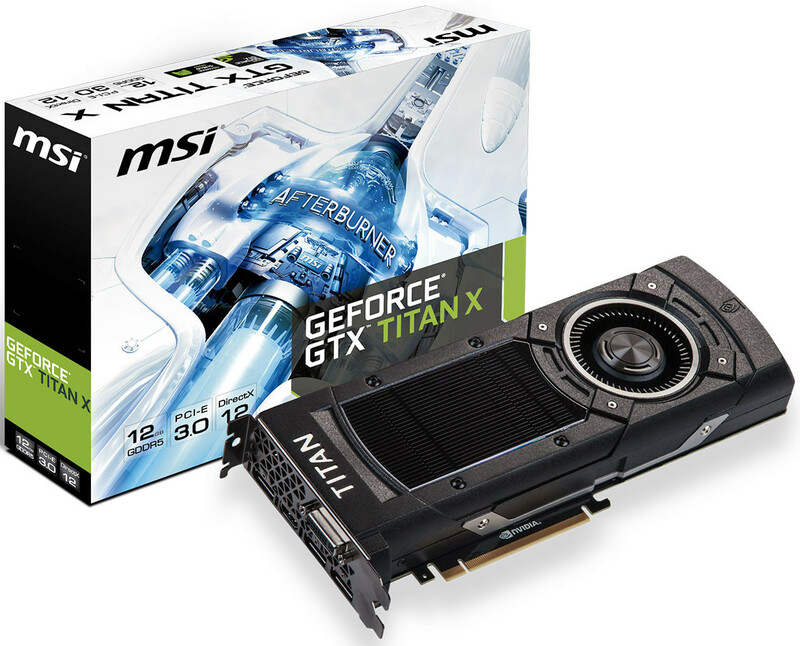 32-bit indices could be considered too much data to submit to the GPU in a mobile device. Furthermore, they are not strictly necessary, as they could be replaced (if needed) by splitting the geometry into two groups defined by 16-bit indices. The solution I devised, which is now part of Vortex 2.0, is to allow the user to specify the data size for the indices when defining the geometry. This provides the flexibility to use 32, 16 or 8 bit indices. You can even have several geometric objects with different index sizes in a scene. The advantage of leveraging this mechanism is that now it is very easy to fine-tune the number of bytes used for index representation for improving performance. For example, using 16-bit indices instead of 32-bit indices would make no difference for representing models composed of less than 65536 vertices, while requiring a copy of just half the number of bytes to the GPU. In the extreme case of 8-bit indices we would be constrained to only 256 vertices, but we would be sending only one fourth of the data to the GPU. This was mostly plumbing work, so no new picture this time. Stay tuned for more updates!